It was a great day for fishing in Spoonerville, so Goofy and his pals went out to the ocean with their boats. Cruising for the big ones in open waters, Pete and PJ were suddenly caught in the ominous shadow of a gigantic ship. When Goofy and Max looked up, they saw a huge pirate ship heading out to Spoonerville Island. Pete and PJ were onboard, victims of a pirate kidnapping! Goofy rowed for all he was worth, but he couldn't catch up to the pirate ship before it landed on the island. 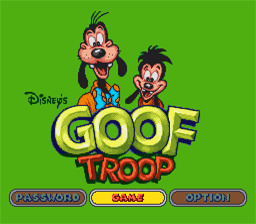 determined to rescue their friends, Goofy and Max set out to explore and find the pirate stronghold. --From the SNES Goof Troop instruction manual.